Colorforms Moshi Monsters 3D Deluxe Playset is a brand new release that will keep children entertained and the imagination going with well-known internet sensational characters! The Moshi Monsters 3-D Deluxe Colorforms Play Set features a 3-D play scene, four stand-up play pieces, and 19 Colorforms Stick-On pieces for play. 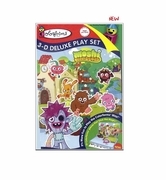 Flip open the Colorforms 3-D Deluxe Play Set and join Moshi Monsters and the Moshlings on an exciting adventure. Colorforms stimulate both creativity and imagination. Colorforms...the original, high quality reusable sticker set is back! Colorforms was introduced in the fifties, and has been popular for more than sixty years. Colorforms is still one of the best activity sets you can find for children ages 3 and up. Manufacturer recommended for ages 3 to 8 years.